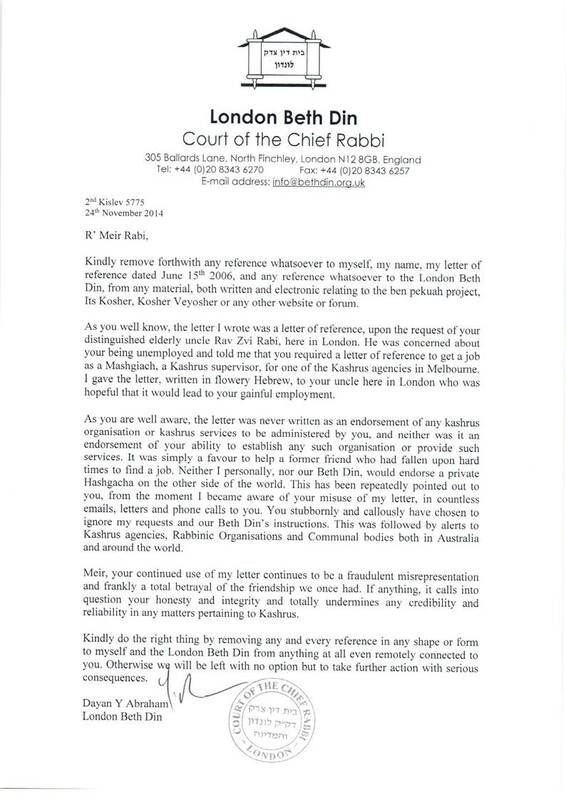 The letter below was penned by famed Rosh Yeshivah of Telz in Cleveland and member of the Moetzes Gedolai HaTorah in the USA, Rav Eliyahu Meir Bloch ז’ל. I had heard about the sentiments, but it is all the more powerful when one reads the actual letter. Well, not quite the actual letter, but a translation of the letter, which I lifted from the following article. My respected friend, Mr. David Ulman, Shalom and with eternal blessing! First I would like to express my gratitude to you for contacting me to request clarification with regard to the holiday of Independence without judging or criticising from afar. Now let me respond to the matter with clarity. The copy of the advertisement that you sent to me is indeed correct. Furthermore, this event was attended by the Women of Agudath Israel and Pirchei Agudath Israel. The reason that their attendance was not mentioned [in the ad] is simply due to the fact that they decided to attend later [after the flyer was published], and they became an official part of the evening’s program. 1) Is Yom ha-Atzma’ut a worthy matter for the Ultra- Orthodox community to deliberate and to express a stance regarding it[s celebration]? 2) Is it worthy of celebration? 3) Is it worthy for the members of Agudath Israel to unite with the members of Mizrachi in a fashion which allows us to express our approach and influence others to act according to the spirit of Agudath Israel? The independence of Israel and the establishment of the State are important events in the life of our nation. It is worthy for members of Agudath Israel to participate when there is a possibility to express their thoughts and views before a large forum in order to influence them regarding the approach of the Agudah and to refute the negative sentiments against Agudath Israel. In my opinion, despite all of the defects and deficiencies in the leadership of the State of Israel, its mere existence, which happened via revealed miracles, is of great significance that deserves recognition and appreciation. This recognition must be publicly expressed for two reasons: First, because the truth must be expressed. Second, that all should know and recognise that our war against the Government of Israel is not targeted against the existence of the State. Participation with Mizrachi in a fashion that Agudath Israel is free to express its views was recognised as the correct approach by creating a religious front that Agudath Israel is always willing to renew. Although I know that we disagree with Mizrachi on our fundamental beliefs, and in no way are our views consistent with each other, and consequently our actions are totally different, still there are many issues on which we can work together and, through this, strengthen the ultra-religious and its influence on the life of the nation. After this preface let’s discuss the issue of our participating in the celebration of Yom ha-Atzma’ut. The collective meeting for Yom ha-Atzma’ut was not particularly festive; it was simply a symposium conducted by all the Orthodox factions and gave everyone the opportunity to express their views. Of course, if we would not have attended, the meeting would have turned into a platform focused on criticising Agudath Israel and its leaders who are the “Gedolei ha-Torah.” Our participation on the other hand caused the speakers to speak politely and allowed Agudath Israel to express its views in front of more than one thousand people. Hence even if we would not have related to the State of Israel in a positive fashion, our participation would still have been of value. However, in my view since the creation of the State of Israel is indeed an important milestone in the life of our nation, our relationship to it, therefore, is positive, and our participation is obligatory. Our participation together with Mizrachi is despite the fact that the religious political front was canceled. In Cleveland there is a religious front by the name “Orthodox Jewish Association” comprised of representatives of ultra-orthodox synagogues, Agudath Israel, Mizrachi, Young Israel and representatives of the educational institutions of the ultra-orthodox. A condition was established that if there is any issue with which one of the participants disagrees, the organisation cannot act. For example when rabbi… came here as the representative of the so-called Jewish Agency’s Torah Department, during their month of propaganda, and most of the organisation’s members were willing to participate in an open forum, Agudath Israel and our educational institutes did not agree, despite our personal relationships with rabbi…. Of course Mizrachi acted independently, but not in the name of our joint religious organisation. Due to this organisation, thank God, we were able to eliminate non-kosher at United Jewish Appeal banquets and gatherings and accomplish other positive outcomes that strengthened the religious position and its respect in the community. Therefore, if we would not have agreed to organise the Yom ha-Atzma’ut gathering of course we could have stopped the organisation from attending. However, our view is positive [towards Yom ha-Atzma’ut] and therefore we did attend. It is noteworthy that nothing was done without consulting with us. We oversaw all preparations to insure all would be in accordance with our interests. For example, no irreligious attended and all women sat in a separate section behind a Mechitzah etc…. To summarise, I feel it correct to clarify why this was conducted this year and not in previous years. The reason did not emanate from our side but from the side of the other factions. In past years all the Zionist factions would conduct the gathering in accordance with their approach and of course we are neither part of them nor their ways. But this time they approached us with a proposal that the gathering would be only with religious people in accordance with the spirit of Torah and asked us if under these conditions we would be willing to participate. And thus, despite the fact that this year we are actually at war with the Mizrachi even more so than in previous years, we still feel it was the correct approach to demonstrate to them that on issues on which we are in agreement we can work together. In general, I already expressed my view that we lost a great deal by refraining from recognising correct issues just because the irreligious and those manipulated by them, the Mizrachi, agreed to them, because through agreeing with them we would have strengthened their false opinions. In my opinion, our views did not find receptive hearts within the nation not because of our stance against their incorrect views; rather it is because of our negative position against the correct views such as learning Bible, speaking Hebrew and Eretz Yisrael. The populace cannot understand our concerns and, moreover, when we emphasise our positive views they will accept us and allow us to fight the falsehoods. In addition, I must express that this attitude of ours is not unique to our life in America. We acted this way in Lithuania as well despite the fact that then, as now, we were totally zealous concerning anything that, God forbid, is not in accordance with the spirit of Torah. We did not regress because of persecution, denouncement and sometimes even suffering, sorrow and much damage to our holy Yeshiva. 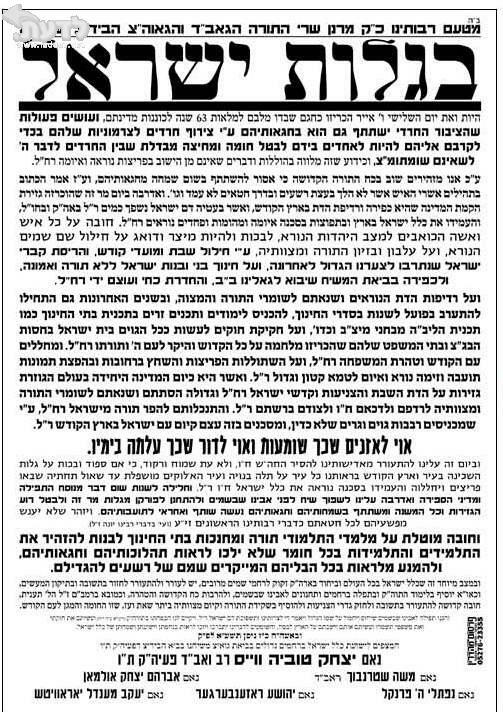 I understand but do not accept the view of Hungarian Satmar, Toldos Aron, Shomer Emunim and similar, that the establishment of a State for Jews is the work of Satan and should be rejected. Such a view, in the opinion of many great sages is not justifiable, and its tenuous reliance on the three oaths is seen as an halachic fiction. I understand, but do not agree with the view of Chabad and some other Chassidim and Misnagdim, that “it is what it is”. They contend that the establishment of the state wasn’t a necessary event in the development of events leading to the Mashiach. However, given that the State is a reality, they will support the people within the State. Chabad, for example, refrain at all costs from saying the State of Israel. Listen carefully. They will always say Eretz Yisroel, following the practice of the last Rebbe, who I believe only referred to it as the “State of Israel” but once. They do not disagree with the metaphysical importance of the State, but have halachic techno-legal reasons for their particular practice. For example, the Rav didn’t say Hallel and at Kerem B’Yavneh we said Hallel without a Bracha. I do not understand why people who do not agree that the establishment of a State for Jews is the work of Satan (e.g. Satmar) or who are passively ambivalent about the eschatological significance of a State (e.g. Chabad) not only say Tachanun, but insist on saying Tachanun. 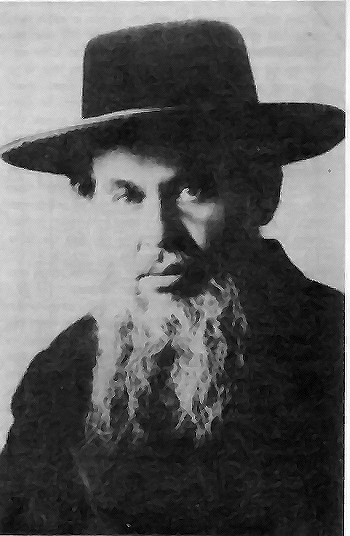 It is related that the Chazon Ish, who was saved from the events of the Holocaust by no less than the efforts of Harav Kook ז’ל, insisted on saying Tachanun. In Melbourne, a number of years ago, when a Bris occurred at the ultra-orthodox Adass Yisrael congregation, Rabbi Beck insisted that Tachanun be said davka because it was Yom Ha’atzmaut and that it would be entirely wrong for someone to come away with the impression that Tachanun might not have been said on Yom Ha’atzmaut. It is well-known, that Chizkiyahu the great King, in whose generation the Gemora tells us (in Sanhedrin from memory) that Torah study and knowledge was in a high and unprecedented state, failed to materialise the Geula because Chizkiyahu became too haughty and felt that it was unnecessary to utter special praise (Shira) to Hashem and thank him for the miracles that Hashem wrought on Am Yisrael. Shira, praise and thanksgiving, is the power to see the illumination of the future in the present. It is the power to perceive our existence as a link between the past and the present, and the power to raise everything towards an all-encompassing Geula. Therefore after crossing the Red Sea, in “Shirat Ha’Yam” – it states: “Az” Yashir. Az– “Then,” past tense, is a reflection on the past, “Yashir” – “will sing praise” in the future tense. There is the joining and encapsulation of the past and the future, thereby giving meaning to the present. It is possible to study Torah as in the days of Chizkiyahu, to the extent that even the children are expert at the laws of tumah and tahara, yet still the Geula is hindered and delayed. Yeshayahu expected Chizkiyahu to offer praise, and sing shira to elevate the entirety of reality. Chizkiyahu failed and the world was set back in reaching its goal. One’s individual Torah, despite it’s great value and benefits, is not termed Shira. Only the transcendent Torah that strives to see how everything is bound to Hakadosh Baruch Hu is described as shira. 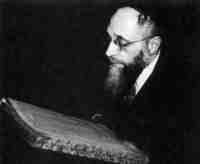 Those who separate the Torah from the State as if they are two entities are not singing. This is how Rav Kook explained the criticism of Chizkiyahu. “That in his days briers and thorns covered Eretz Yisra’el,” for Chizkiyahu did not demonstrate how the Torah is also connected to the land. In justifying Chizkiyahu, some have posited that the miracle of his victory over Sancherev was not as great as the sun standing still (in the days of Yehoshua) and that is why Chizkiyahu didn’t sing Hashem’s praises. Mortals, however, are not qualified to judge which miracle is greater or more substantial. Judging such things is an expression of haughtiness, and this is what Chazal meant. Shira dissolves the temporal manifestation of ingratitude, as supplied by the Yetzer Horah. What is most puzzling to me is that even those who don’t recognise the need to especially sing to Hashem still insist on making this a day like any other and continue saying Tachanun. Yet, on their own days of celebration (e.g. a special day in a Chassidic court), they suspend the saying of Tachanun. This story originally appeared in שבת בשבתו in 2001 in a weekly Parsha sheet put out by מכון צומת and was retold by Rav Aviner. During the 1929 riots, on Friday, the 17th of Av, rioters ran wild throughout the country, cruelly ransacking and murdering. In the afternoon, thousands of inflamed Arabs stormed out of the Mosque of Omar after being saturated with the hateful incitement of the Mufti, Haj Amin Al-Huseini, and marched forward, armed with knives and clubs. Most of them advanced towards the neighborhoods of Meah Shearim and Beit Yisrael, with cries of “Slaughter the Jews.” At the head of the inflamed throng marched an Arab sheik, waving a long sword and firing up the rioters not to have pity on men, women or children, since it was a holy war — a jihad. When the rioters reached the Italian hospital, two Charedi youths emerged from the flour mill at the southern edge of Meah Shearim and advanced towards the rioters. One of them, who had curly side-locks flowing from under his hat, pulled out a pistol and shot straight into the mouth of the sheik walking in front, and he died on the spot. The inflamed masses were seized with fright and they began to flee in the direction of Damascus Gate, while the two youths chased after them, throwing a hand grenade which killed three more rioters. Moreover, the rioters trampled one another to death during their escape. Chief Rabbinic Justice of Edah HaCharedit in our own times [now ז’ל, this was correct in 2001]. who lived in the Old City, had to go to Meah Shearim as a Mohel [circumciser]. His family and friends were terribly worried about him, and they begged him not to go, but he insisted. He would not forego the mitzvah. The eighty-year-old rabbi, clad in his tallit, walked to Meah Shearim not by way of Jaffa Gate, but by way of Damascus Gate, a troublesome spot even in normal times. He walked calmly along the same route where thousands of murderers had walked, in order to fulfill the mitzvah of circumcision, and he returned by way of Jaffa Gate. When he was later asked why he went precisely by way of Damascus Gate, he responded, “So that the Arabs would not think that they had succeeded in banishing the Jews from even one corner or street in Jerusalem.” And why had he returned by way of Jaffa Gate? “Such is my regular custom, in order to fulfill the words, “Walk around Zion. Circle her” (Psalm 48:13) (BeDor Tahapuchot, Rabbi Shlomo Zalmen Sonnenfeld, pages 226-229;393-396). It is well-known that the illustrious Rabbi Yosef Chaim Sonnenfeld was not a Zionist. Quite the contrary, he ascribed to the opposite view. 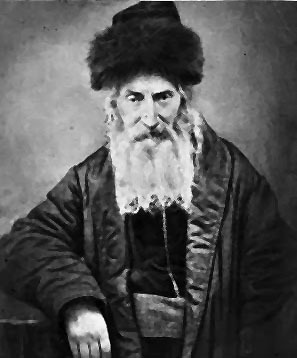 He was the most Charedi of Charedim, and an opponent of Rabbi Abraham Isaac Kook. To say that the Charedim did not sacrifice themselves for this land is a severe libel. Meah Shearim was established on a spot where people were afraid of bandits. The Charedim sacrificed themselves for the Land, or more precisely, for the word of G-d, who commanded us to settle the Land.